Bounding from far-flung expeditions to public school classrooms, Peter Lourie shows students how to write with verve and detail. 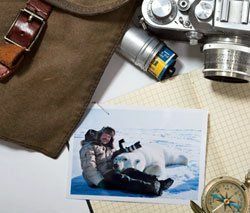 Writing Around the World: A sedated thousand-pound polar bear rests his head on Peter Lourie's lap during a 2009 Arctic expedition to the Beaufort Sea. It's a clear, sunlit day in the bustling Bronx. Girls in blue plaid jumpers and boys in navy chinos with white shirts are filing into the Bronx Charter School for Better Learning. For most of the children in this K-5 school, it's an ordinary morning, but for the fourth graders, the thrill of adventure hangs in the air. Just as the last student enters the doorway, a Subaru Forester pulls up along the curb outside. Perched on its roof is an 18-and-a-half-foot canoe made of Kevlar (the sturdy material of which bulletproof vests are made, the kids will soon learn). Peter Lourie -- a 6-foot-2, 57-year-old world traveler and author/presenter with an Indiana Jones persona, sparkling eyes, and an easy smile -- leaps from the driver's seat. He unloads the canoe of his paddles, a fully stocked waterproof supplies bag, cartons of books, cords, a laptop and projector, and other equipment. Today, he's taking the Bronx fourth graders on a virtual, but nonetheless action-packed, journey down New York State's Hudson River, from its highest pond source at Lake Tear of the Clouds to its mouth at Manhattan's southern tip. Lourie was the first man in history to canoe the 315-mile route in 1990 and, since then, has written 21 books for both kids and adults about his epic experiences around the world. He has explored the Amazon jungle and the mountains of Ecuador; journeyed on the Mississippi, the Rio Grande, and the Yukon; navigated the Everglades and the Erie Canal; dived with sharks in the Caribbean; hung out with Arctic polar bears; and traced the trails of Lewis and Clark and conquistador Cabeza de Vaca. For the past l6 years, Lourie has bounded between his outdoor adventures and school presentations in the classrooms of America, spinning yarns about his excursions. "My goal is to relate what I do as an adventure writer to what students do when they're learning the craft of writing," Lourie says. "The processes are much the same." During the slide presentations, over the course of an hour, students see one particular part of the world (in this case, the Hudson River) as Lourie has seen it. Afterward, he talks about how he moves from the kernel of an idea all the way to the printed book, from the research stage, to the actual journey, then to the journal-collecting process -- using video, audio tapes, notebooks, photographs -- all in the service of documenting details. His experiences are rich, textured, and rife with the stuff kids adore: adventure, danger, monkeys, manatees, and, most of all, buried treasure. Writing Around the World: Archaeologist Louise Leakey (middle), Lourie (left), and a field assistant (right) study global-positioning-system coordinates for fossil finds in Lake Turkana, Kenya, in 2007. Lourie, a graduate of Columbia University's MFA program who once studied ancient bones with the Leakey family in Kenya, had planned to become an anthropologist. But lured by the hunt for buried Incan treasure during a stint in Ecuador, he nixed that idea. Alas, the 750 tons of gold were never found, but Lourie emerged from the befuddling mountain fog with even better bounty -- a story idea for Highlights magazine and the seeds of his first book for adults, Sweat of the Sun, Tears of the Moon: A Chronicle of an Incan Treasure. Lourie's presentations and talks fit neatly into most school curricula, covering geography, history, science, writing, and a flurry of firsthand knowledge of subjects ranging from how to fry up a fresh-caught piranha to how to pack for a river trip. But he's more than just a great talker. "Not only do his books relate to the social studies curriculum, he also talks about how he writes in a way that's very inspiring to children," says teacher Donna Wolfson, who taught fourth grade at the Bronx Charter School. He ignites and nourishes in his young listeners a desire to write and a keen understanding that nonfiction prose needn't rise from the dull, dry dust of ancient library stacks. "I have to smell the smoke of the burning jungle!" Lourie says. At the Bronx Charter School, when Lourie plucks his quintessentially unhip brown crusher hat from his backpack and plops it on his head, the students howl with laughter. They roar when he lopes across the room with his canoe resting on his shoulders, his head hidden from view. But then the mood changes. Lourie begins talking about his childhood -- how sad he felt when his parents divorced, how his dog was hit by a truck before his very eyes. And here he imparts a remarkable discovery. "I wrote a poem about the death of my dog," he tells the kids. "And I realized that I could take sadness and pain and turn it into beauty by writing a poem." The father of two also shares family tales of backyard camping, scuba diving, and snuggling with his young children -- and the students eat it up. He's a rugged man who insists that not only is it more than OK to write about feelings but also that emotion is absolutely essential to good writing. "He talks about a tragic experience and how it started him getting his feelings down on paper. That's a very important lesson for children to learn," says Alison Bankes, a former fourth-grade teacher and head of the science committee at Todd Elementary School, in Briarcliff Manor, New York, who's now retired. That, and the thing about details. "Good writing is detailed writing! Can you repeat that to me?" Lourie asks at every assembly. "Good writing is detailed writing!" shout the 60 fourth graders hunkered down on the multipurpose-room floor. The next day, 80 miles up the Hudson, Lourie unloads his canoe at the Lenape Elementary School, in New Paltz, New York, where deer graze on the grassy grounds in the early morning before the students arrive at school. Adventure Man: Using stories from his canoeing expeditions on the Hudson, Mississippi, and Yukon rivers, Lourie inspires kids to write about what they love. In the auditorium, more than 100 fourth graders gather for Lourie's presentation. Later, they break into smaller sections where he talks specifically about writing. He walks the kids through his process of writing a book, from his first inkling of an idea, to research, writing, and revision, to the morning -- several years later -- when the FedEx truck barrels up his road in Weybridge, Vermont, to deliver the finished product and biscuits for his barking dog. "To research is . . . ?" he asks the students, who by now suspect that the answer goes far beyond spewing facts from Wikipedia. "To study!" one calls out. They're getting it, delving more deeply into what it means to be a writer. This is what Lourie's mission is all about. Even before Lourie arrives, savvy teachers prep to make the most of his visit. At Lenape, the kids have read his books, and fourth-grade teacher Susan Woodburn has used his photo essays to inspire her students to create photo essays of their own. The class has taken a brief but real-life trip up the Hudson on the sloop Clearwater and written text to accompany photos that Woodburn shot along the way. "There's an obvious connection to our study of the Hudson River," Woodburn says, "but the writing workshop where Pete talks about his writing process is where I most utilize his material." To help Woodburn's students write newspaper-style feature articles, Lourie explains how, on the trail, he keeps a digital journal and interviews colorful characters along his path. Primary research, he reveals, makes a story come alive. In nearby Wallkill, New York, library media specialist Ellen Rubin brings in authors to speak to students, and she booktalks, or introduces, each author's work before his or her arrival. To Rubin, the success of a presentation depends on how well teachers prepare the students in advance, in addition to what the author can offer. In many ways, an author's visit is what educators make of it (though not every writer naturally connects with kids the way Lourie does). Rubin employs her authors innovatively. She invited Robert Lipsyte, author of The Contender, about a high-school-dropout boxer, to address the high school football team, and she pulled in local author Da Chen, who wrote Sounds of the River, for calligraphy, flute, and memoir-writing workshops. 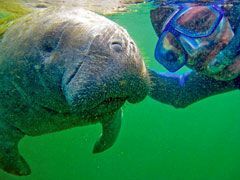 Writing Around the World: A 2009 snorkling trip in Florida's Crystal River brings Lourie face-to-face with an endangered manatee. Amy Neale, library teacher at the Michael Driscoll School, in Brookline, Massachusetts, created a presentation of Lourie's photos and helped her students formulate questions before his arrival. She used his On the Trail of Lewis and Clark to spur fourth graders in their research projects, Arctic Thaw for seventh- and eighth-grade science classes researching global warming, and Mississippi River for third graders studying the subject. "Everything he does has a curriculum connection," Neale says. Cheryl Taylor, library media specialist at Hillcrest Intermediate School, in New City, New York, used Lourie's Web site to design a scavenger hunt. The site is a technology treasure trove where kids can listen to frogs croaking in the Amazon or scout out photos of eagles and owls. Her students also hung bulletin boards with artwork, wrote travel journals and newspaper articles, and constructed a board game based on Lourie's books. "The whole school was involved and every bulletin board was covered," Taylor says. "It always makes a difference when everyone is included." At Todd Elementary School, library media specialist Tara Phethean instituted Lit Online, whereby students posted messages about Lourie's books on a password-protected blog in anticipation of his visit. Nancy Smith, recently retired library media specialist from Elsmere Elementary School, in Delmar, New York, prepared her students with Lourie's photos and texts and had her students research such topics as why the Hudson is called "the river that flows both ways" and the definition of the source of a river. "For us, he's always a culmination, but never an ending," Smith says. "His presentations led to the next piece -- writing instruction. Affecting students' motivation and ability to write was my ultimate goal." Barbara Stropko, librarian at Carlos Rivera Elementary School, in El Paso, Texas, pulled out all the stops. Using construction paper, students made murals in three 64-foot hallways tracing Lourie's trips down the Rio Grande from Santa Fe to El Paso, following the Lewis and Clark expedition up the Missouri River, and depicting Mayan ruins and the rain forest. Stropko and her husband built four bottomless Masonite canoes in which six to eight students at a time could step inside, grasp the canoe, and traverse the hallways while she played the role of tour guide. 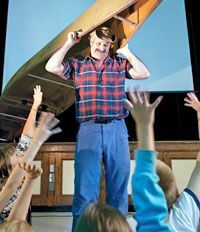 "By the time Pete arrived, all the kids were ready to have him speak about how he wrote his books," says Stropko. In bucolic Ballston Lake, New York, nearly 100 students sit on the steps of the school library. This is the third time Lourie is presenting at Francis L. Stevens Elementary School. "We had kids who were reluctant writers," says Principal Ralph Rothacker, "and now we can't get them to put down their pens!" Fifth-grade teacher David Somoza (coauthor, with Lourie, of the book Writing to Explore: Discovering Adventure in the Research Paper) has fueled a passion for writing at this school. Meeting Lourie some years back, Somoza became fascinated with the author's methods. "I wanted to know more about his process and how he blends storytelling and nonfiction, because he does it very gracefully," he says. "His books flow like stories, yet they're loaded with facts." Somoza decided to try Lourie's techniques with his students' research papers -- turning tedious reports about states into colorful, dynamic examples of project learning at its best, with kids blending fiction and storytelling with facts, researching everything from how to schedule a flight to Seattle to how to find a charming Southern bed-and-breakfast. At the Ballston Lake school, Somoza dims the lights for a video he's made -- using Microsoft's Photo Story 3 -- of the Seychelles, with atmospheric photos set to the rhythmic beat of Senegalese musician Cheikh Lo. The students have been working on descriptive essays about this alluring location for nearly a month, and this is the grand finale. Lourie will spend the next two days guiding the fifth-grade classes through peer-writing workshops. The students take out their essays and break into groups of six; each child also has a copy of five peer essays as well as a writing rubric. Lourie and Somoza and the other fifth-grade teachers move among the groups as the kids discuss their work. The students take turns scanning the pieces for unifying principle, sentence variation, and other elements, then each author responds with a rewrite action plan. Getting words down on paper isn't the end point, they now realize; editing and revising play crucial parts in the writing process. "I love the fresh way you describe the water," says fifth grader Julia to her peer Brittany. She points out where she thinks the piece works and where it doesn't. The students have taken Lourie's instructions to heart, and their critiques are kind, specific, and constructive. At the end of the workshop, fifth grader Brandon is pleased. "I learned that adding a narrative thread -- explaining who you are, why you're there, and what is your purpose -- can make a piece more interesting," he says. Adds schoolmate Madilyn: "Peter Lourie has shown me that you can always make a piece of writing even better and more beautiful if you spend some time revising it, either by yourself or with a friend." As Lourie travels from school to school, presenting his adventure-writing assemblies and workshops, he recounts the legend (or maybe the fact) of Captain Kidd's treasure -- buried atop a mountain along the Hudson River, guarded by the ghost of the pirate's slain dog. "I always thought if I could get about 500,000 kids to come with me, we could cover that mountain by foot and find that treasure!" Lourie says enthusiastically. "You guys want to come with me? How many say yes?" Without fail, every hand in the auditorium shoots up. "Good! That makes about 435,000 of you!" Lourie quips. Then, under his breath, he whispers, "The day they don't say they'll come with me is the day I quit this." That day sure won't be dawning anytime soon. Kathryn E. Livingston is a freelance writer based in Bergen County, New Jersey. Go to "How to Build Your Own Multimedia Adventure."